What an excellent tasting tonight at Storyteller Wine Company in Portland with Steve Edmunds of Edmunds St. John. After all these years, I finally connect IRL with Steve, maker of some of my favorite California wines and something of an inspiration for my own winemaking. I arrived hoping not to monopolize Steve with my geeky wine questions and fawning. Turns out I did monopolize his time, but without asking too many questions. He seemed delighted to talk shop and I know enough of his history to chime in with comments that only opened the door to more knowledge. You often hear of people being "great guys" but Steve really is. We talked about old Brandlin Ranch mourvedre and how Steve lucked out to work with old vines and wise old farmers early in his career who taught him so much about grapes. We talked about his making wine in Alameda, CA, and up in the Sierra foothills where he's sourcing a good quanity of obviously terrific grapes. We talked about not owning vineyards, how even an established guy doesn't always get to call picking times if he's not a significant buyer at a particular site (not common for Steve, but still an issue once in a while). Most memorably, we talked about energy. For the geeky, Steve said that he likes to pick fruit with pH below 3.5, otherwise the energy falls apart and there's no life. I've picked grapes on both sides of 3.5 and I have to say I'm leaning to the short side of 3.5 from here on out. That's not absolute, but even in a hot year like 2009 where we waited to pick so flavors could develop, I see that I could have picked earlier and had ripe flavors without degradation of acidity. Ok, how were the Edmunds St. John wines? Wow, really good. Really full of energy, so that I'm feeling the energy and life force to write about them. We started with the 2008 Heart of Gold, a 59% Vermentino (Rolle) and 41% Grenache Blanc blend from the Sierra Foothills. This was indeed golden, minerally and full of life. I sensed a bit of alcohol that detracted but these were quick tastes and I'd gladly try this again. Then the 2009 Bone-Jolly Gamay Rose from the Witters Vineyard in the Sierra Foothills that was crisp with minerally strawberry, pretty nice. Steve isn't one to toot his own horn, but he's really happy with this and I won't argue. The first red was the 2008 Bone-Jolly Gamay Noir Witters Vineyard, the red version of the rose. This is classic gamay, worthy of cru Beaujolais with what must be Sierra terroir. Bright and perfumed, with great soil notes and juicy gamay spice. I would have bought any of these, but I did buy this. Then the 2006 That Old Black Magic, a blend of sources that used to go into my old favorite Rocks and Gravel. This was darker and more dense than I remember any Rocks and Gravel, usually more bright red and peppery. Still, I like. Finally, two syrah that again completely turn the notion of California syrah (or pretty much any new world syrah) on end. First, the 2005 Syrah Parmelee-Hill Vineyard from the Sonoma Valley that made me think of Cornas or Hermitage. Lots of olive and game notes that I love in syrah, with excellent tannic texture and full, juicy flavors. I also bought this. At the mid-$20s, this is ridiculous value in ageworthy but already delicious syrah. Then the 2005 Syrah Bassetti Vineyard, with intense floral notes that made me think Cote Rotie and a saline scent that reminded me these grapes came from just a few miles off the central California coast. I asked if this is on limestone soil, but Steve says basalt, something we know well here in the northwest. Sometimes locals say basalt is a country cousin to granite and limestone, but this wine alone reminds me that basalt is an excellent growing medium. What intensity and density, again lots of olive notes and rich flavors that are still bright and energetic. I've written before about how Robert Parker has taken Steve to task for trying to make French wines in California. More than ever, I think that's simply wrong. What Steve's making is all California, just full of energy that can't help but connect to his French inspiration. There are no French wines that taste like this, and no California wines that taste like there. These wines are unique. It's no knock that they're so different from most of what you get from my home, the Golden State, nor that in a line up of top French wines, they'd more than hold their own. All that and these are all, with the exception of the $45 Bassetti, priced under $30 with most under $20. That's even more absurd than Parker's comments. I try to keep my composure when tasting wines that really excite me. So if you'd been there at Byron and Dana Dooley's Seven of Hearts tasting room in Carlton, OR, the other day, you might not have noticed me flipping out on the inside. That's because I was trying the most exciting Oregon pinot noirs that I'm tasted this year and back into the last. I'd heard about Byron's wines for the past half year from sources I trust. I had a bottle of the 2007 Seven of Hearts Pinot Noir Eola-Amity Hills and enjoyed its delicacy. I'd also met Byron at a dinner earlier this year and tried the now released 2008 Luminous Hills Pinot Noir Lux, which was young of course but also very interesting in aroma, texture and taste. That turns out to be a theme with Byron's wines. Rather than detailed recountings of the specific wines, which I didn't note, let me just say -- try Byron's 2008s. From the base Seven of Hearts Willamette Valley Pinot to the fanciest "Reserve" bottling, they are all tremendously interesting, unique wines with real savor. There's plenty of ripe 2008 fruit, but great acid balance and tannic texture. Color isn't an issue for Byron, so if saturated purple is your idea of pinot noir hue, these might not be for you. However, if you're like me and you're looking for pinot noir that rises above the crowd, that tastes and smells great but will be even better on the dinner table, and will unwind well in the cellar, these are your wines. The best part? I think the most expensive wine is $35. Sometimes I wonder if people don't get the widespread respect and buzz they deserve if they don't price their wines high enough. Obviously that's no reason to raise prices; it's just a shame. I'd put these wines up against anything in this state. They won't have the dark hue or oaky sheen of others, but for aromatic interest and depth & percision in the mouth, well, let's just say I have my work cut out for me if we're making wine from the same source this coming year. Actually, I'm looking forward to the challenge of seeing where my technique matches up, and learning from Byron as we go. I haven't been out to Byron's vineyard yet, but I can't wait for the chance. In the meantime, I've recommended one friend to check out the tasting room on E. Main in Carlton this weekend when she has family in town. There's a lot of wine and food to explore in Carlton, but Seven of Hearts should not be missed. Even more so because Dana sells her incredibly delicious Honest Chocolates in the tasting room. They even have a few chocolate and wine pairings to try. Let me know if you've tried these wines (and chocolates) and report back if you visit. I want to hear what others think of these incredible wines. I spent most of Sunday bottling my last homemade wine, the 2008 Vincent Pinot Noir Zenith Vineyard. It was a great day, the culmination of nearly a decade of home winemaking, finishing as it began. Out in the garage, by myself, listening to the radio, working quietly. I love making wine commercially but I'll miss the simplicity of the garage. 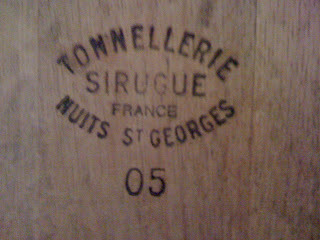 Here's a shot of the barrel in the converted water closet out in the garage (apologies for the crummy iPhone photos...). 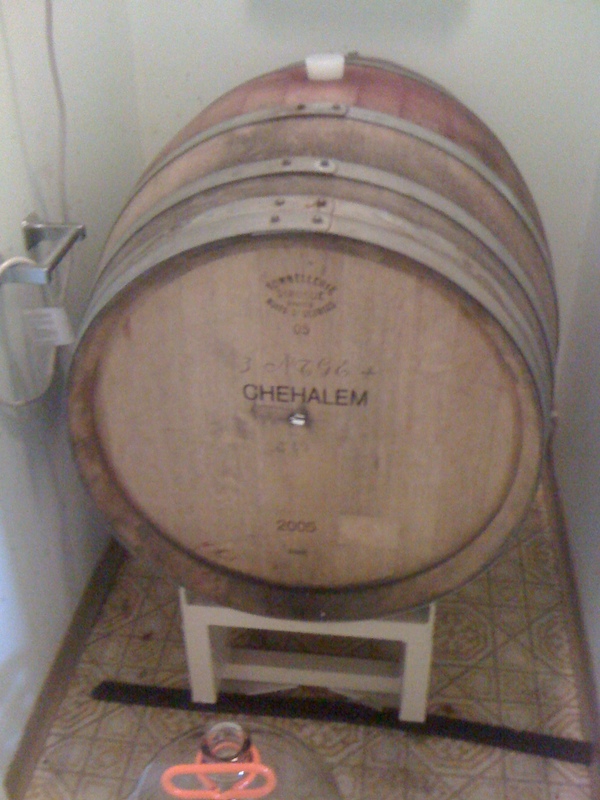 I bought the barrel from a local winery. It was new in 2005 but I paid a pittance for it after only 3 years of use. Yes, it's French oak (people always ask). The cooper is Sirugue. I love their brand. To touch up the wine with a little sulfur at bottling, I rack into 5 gallon carboys with a tiny bit of SO2 solution. 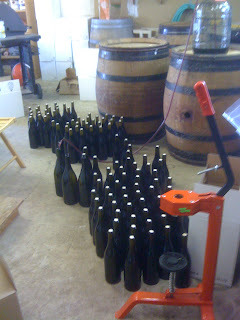 Then I use a barrel turned on end to fill the bottles. 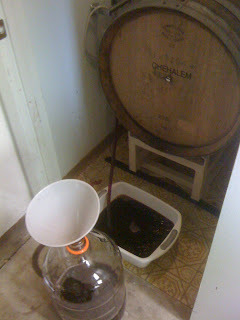 Here, I'm at the bottom of the barrel so I rack into a tub to maximize gravity flow, then gently pour into the carboy. Here's a shot of many, many newly corked bottled with the floor corker on the right and mags slowly filling (giving me time to take the shot). In the end, I got exactly 23 cases of 750ml bottles and two cases of 1.5L mags. There wasn't much sediment after a careful racking last summer. The last bottle I filled came from the minor sludge from the very bottom of the barrel, collected by rotating the barrel upside down with the tub directly beneath. We'll drink that once it settles. Now all that's left is printing one final homemade label run, before we go with a redesign for the first commercial release later this year. Here's the proof. How's the wine? I'll leave it up to you. Let me know if you want to try it. I will say I'm definitely the happiest with it of anything I've made...and I wish I had a whole lot more. I'm looking at doing one final garage tasting in May, date to be determined. You're all invited, but email me vincent.fritzsche[at]gmail[dot]com so I know you're interested. Once again, John Thomas has produced a winner. This is translucent, savory red fruited wine with lovely fragrance. The aroma is slightly lifted but it's all about wild strawberries and well integrated woodsy spice and ash notes. There's a good mix of breadth and focus to the flavors. It's not rich but it is mouthfilling, covering the palate yet still nicely precise and detailed. This is drinking well now but should age nicely for some years given the bright acidity. Fans of extract and weight might not get this wine. I love it. Easter dinner and tasting note with images. 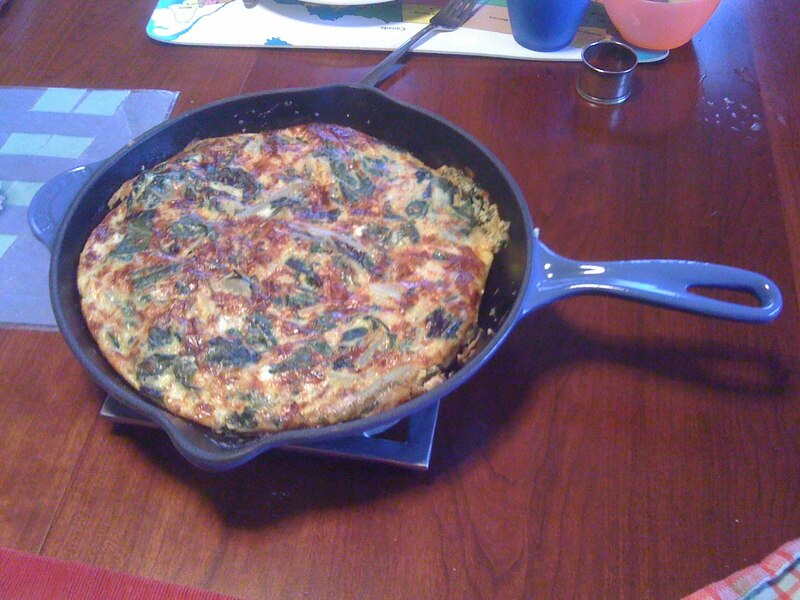 Onion and chard omlette with gruyere, fluffy textured, delicate and rich at once. 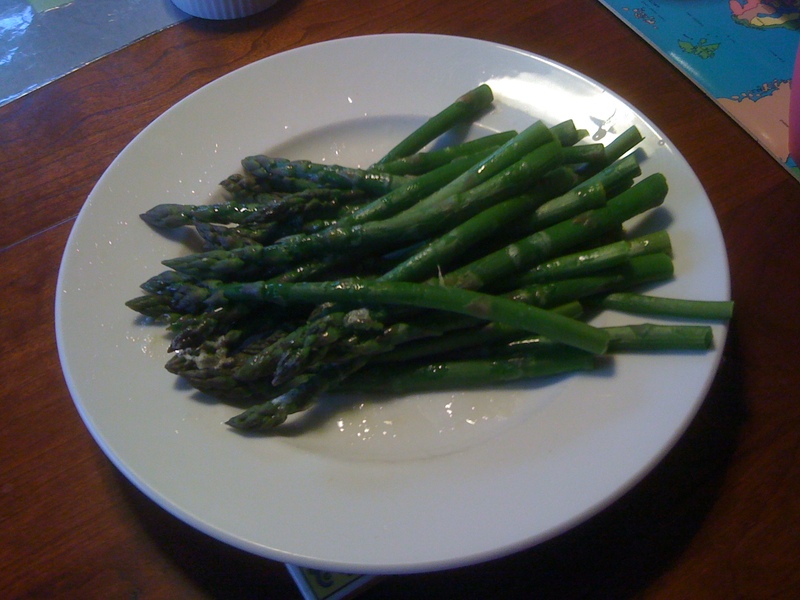 Steamed asparagus with lemon, sweet butter and fleur de sel, not as sweet and tender as you'd hope but pretty good. 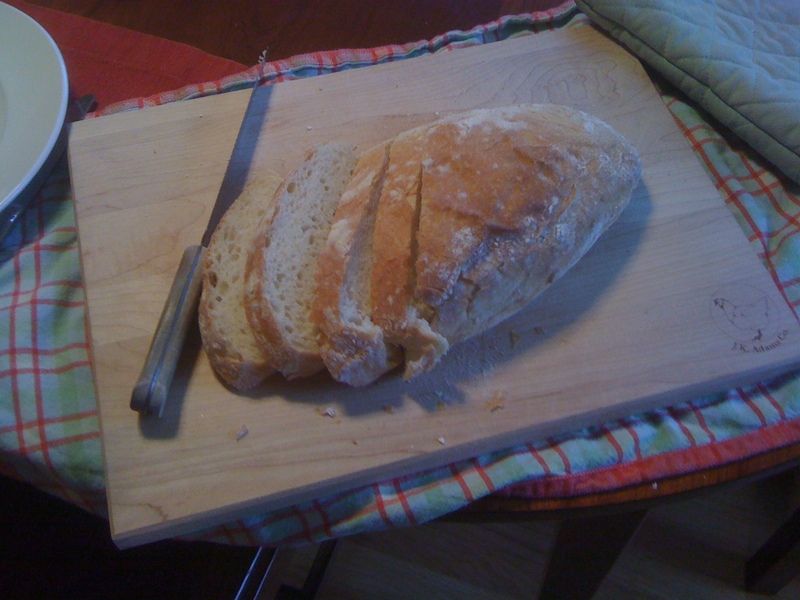 Warmed pugliese that's a little spongy but the kids like that. 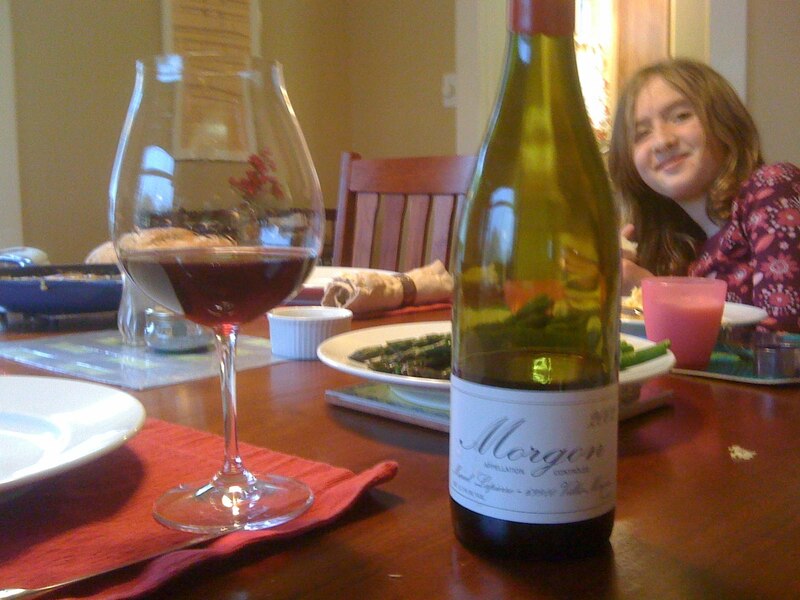 2002 Marcel Lapierre Morgon, rusting a bit as you can see, a lovely complex aroma of strawberry preserves, soil, black tea and hummus. Softly textured with bright acidity, broad flavored, strawberries in autumn with a little cheese rind on the finish, obviously low sulfur here but more than alive and delicious with the meal, especially texturally. Please age your best cru Beaujolais. It's worth your time and cellar space, and worthy of a simple but special family dinner on a cold spring holiday. Three Angels is wine made in Carlton, OR, by Ed Fus, who's specifically in zinfandel and other varieties like primitivo. I tried a few from 2007 and loved the Avery Vineyard Zinfandel from the Columbia Valley. I'd never heard of the producer but loved the peppery, juicy Avery zin. Then I had the pleasure of meeting Ed at last year's Portland Indie Wine Fest, where he was featured. This year, Ed provided a couple of samples of 2008s to try, and I'm happy to recommend both. The 2008 Three Angels Zinfandel Avery Vineyard Columbia Valley. This is in the low 14% alcohol range, downright subtle for most zin these days. This is just terrific zinfandel. Ripe but not overripe, slightly herbal and leafy but with plenty of juicy raspberry fruit, then a blast of white pepper that gave the wine another dimension. Maybe it reminds me of great old Amador zin, or something from Ravenswood in the old days. Really, it's excellent NW zinfandel and something I'd recommend any zin lover try to see what's possible up here. So, in my last post, I wrote about some "Texas" wines. Only the wines I wrote about weren't all from "Texas," necessarily. Thanks to Russ Kane at VintageTexas I found out that the subtle phrase "for sale in Texas only" on so-called Texas wine labels is essentially code for "the grapes and/or wine used are in part or completely from out of state." It allows the label to not have to list an appellation, hiding the real source of the wine. I remember seeing that phrase on several bottles in various wine shops and sections at grocery stores on my Texas visit. I know that the Becker "Iconoclast" wine I wrote about had that phrase on the label. I'm not sure about the others, but I know I saw that phrase enough during my visit to wonder about it. Honestly, I assumed it was a taxation issue, so that you might pay less tax if you only sold in state. Why assume that? Because there's an AVA for multi-state wine. It's call "American." You saw it on 1996 Washington wines when severe winter weather led to an extremely short crop that meant several wineries bought California and other wine to fill out bottlings. I've seen it elsewhere, without shame. Apparently, in Texas, the truth doesn't set you free. Perhaps other states have this sneaky kind of thing to obfuscate on the true source of the wine. I don't want to single out Texas unnecessarily. But I'm let down and frankly kind of pissed to learn all this. I'm a wine professional and that phrase wasn't even clear to me. How can that be ethical? Good going Texas.